Redshirt sophomore forward Olivia Gumbs shoots against St. Joseph's at a game earlier in the season. The Colonials (8-17, 5-7 A-10) fell to Dayton 62–53 for the second time this season Sunday. The back-and-forth game, which featured five lead changes and eight ties, was decided when Dayton (13-10, 8-4 A-10) exploded for a 15-0 fourth-quarter run led by junior guard Jayla Scaife, helping the Flyers overcome a late six-point deficit. The Colonials, who are now on a five-game losing streak, had previously defeated the Flyers 46–45 at home Jan. 12. 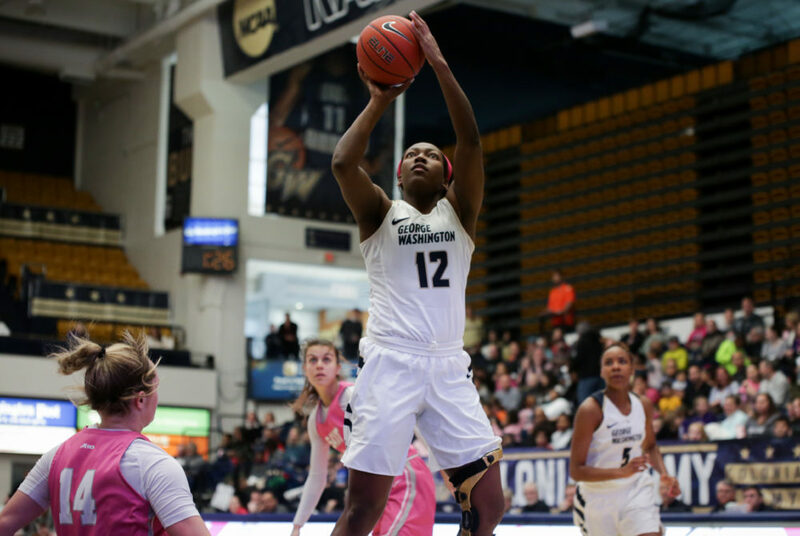 For three quarters, the Colonials found success in limiting the conference’s top offense with another strong defensive effort. But the Flyers flipped the script in the fourth quarter when they outscored the Colonials 25–14. With freshman guard Maddie Loder unavailable due to concussion-like symptoms, freshman center Kayla Mokwuah got her first career start alongside sophomore forward Neila Luma and senior forward Kelsi Mahoney in the frontcourt. Mokwuah responded by tying her career-high with 16 points on 7-for-9 shooting with six rebounds, three assists and three blocks. Mahoney, who finished the night with 13 points and four rebounds, and Luma, who finished the night with 11 points and four rebounds, were the only other Colonials in double figures. Bautista struggled, scoring just five points and shooting 2-for-12 from the field with one assist. GW’s offense looked much improved overall until late in the game. The Colonials ended with 16 assists on 19 made field goals and led for 26 minutes at UD Arena, where Dayton is nearly undefeated this season. Mokwuah continued her recent stretch of success, getting things started with six points, three rebounds and a block in the first quarter. Bautista was aggressive as well, attempting eight shots in the first period while Savino picked up three early assists. As a team, the Colonials turned five offensive rebounds into seven second-chance points to take a 16–11 lead into the second quarter. Redshirt sophomore forward Sarah Overcash, sporting a brace on her left knee, played a big part in GW’s success on the offensive glass to open the game, grabbing three offensive rebounds in the first half. Scaife, Dayton’s leading scorer, scored five of Dayton’s 11 first-quarter points but had to watch from the sidelines for much of the second quarter after picking up her second personal foul with 4:33 remaining in the first half. Dayton trailed 20–17 when Scaife left the floor, but Dayton’s supporting cast fought back to tie the game 25–25 going into the locker room. Part of GW’s success in the first half was limiting Dayton’s transition offense. The Colonials held the Flyers scoreless in fast break points across the first 20 minutes of action. But things changed in the second half, when Dayton racked up 12 fast break points and began to exploit its potent transition offense. “They knew what they needed to do: score more points and make the game faster to have an advantage, and certainly their style of play won out in the end,” Rizzotti said. Dayton head coach Shauna Green picked up a technical foul with 6:57 remaining in the fourth quarter when redshirt junior guard Brittany Ward was called for an offensive foul in a scrappy final frame. At that point, the Colonials were in the midst of a 10-2 run, battling back from a 37–35 deficit at the end of the third quarter to take a 45–39 lead with 6:41 remaining in the game. The Colonials still led by six points with 5:33 to play. But the mental miscues that have afflicted the Colonials over the past month came back once again in the final five minutes of play. Scaife scored four straight points over the next minute, which included a missed box-out by GW on a Scaife three-point attempt. Sophomore forward Chyna Latimer then turned the ball over to the Flyers on the next possession and Dayton redshirt sophomore guard Araion Bradshaw converted a long-ball with 2:47 left to give Dayton its first lead 51–49. After scoring just five points in the first half, Scaife found her rhythm in the fourth quarter and chipped in 13 second-half points for a game-high 18 points. She narrowly missed a double-double with nine rebounds to her name as well. Turnovers and lockdown man-to-man defense by Dayton held off any chance of a GW comeback with less than three minutes remaining. Held scoreless from the 5:33 mark until there were just 49 seconds left, the Colonials were hampered by five turnovers in the final period and 15 giveaways in the game. Dayton committed only eight turnovers on the afternoon. The Colonials will head to Amherst Wednesday to face Massachusetts. Tipoff is set for 7 p.m.